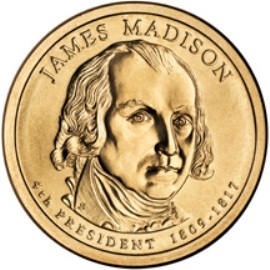 The James Madison Presidential Dollar marks the fourth in the series. The coins were first released into circulation on November 15, 2007. Our fourth president served two terms in office from 1809 to 1817. Some interesting facts about him include being the shortest president at 5'4". He also graduated Princeton University in only two years and at the young age of 29 he was the youngest member of the Continental Congress.